A senior Chinese official has made a rare admission about the extent of the use of torture in getting convictions in China's courts. Wang Zhenchuan, Deputy Procurator General, said at least 30 wrong verdicts were handed down each year because torture had been used. Mr Wang said the real number could be higher, according to state media. Confidence in China's justice system has been seriously undermined by recent high-profile wrongful convictions. A butcher executed for murder in 1989 was proved innocent when his alleged victim was found alive, while a man was freed after 11 years in jail when his wife, whom he was accused of killing, was also found alive. Mr Wang's unusually frank comments appeared to be part of a campaign to tackle problems in the judicial system, and shore up public trust. He said suspects' rights needed to be protected by stopping the use of illegal interrogations involving the use of torture. He said illegal interrogation existed to "some extent" in local judicial practice. "Nearly every wrongful verdict in recent years is involved in illegal interrogation," he said, according to the official Xinhua news agency. China outlawed torture in 1996, but a UN special envoy on torture, Manfred Nowak, said last year it remained widespread. Mr Nowak, who spent two weeks in the country, said torture methods included electric shock batons, cigarette burns, and submersion in pits of water or sewage. 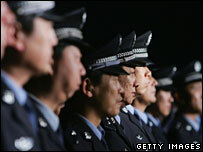 China rarely admits publicly to weaknesses in its judicial system. But correspondents say the recent high-profile mistakes appear to have prompted a change of thinking. In January, Mr Wang said China was to begin recording police interviews in workplace-related crimes to stop confessions being extracted through torture. And last month, China's parliament approved a law allowing only the country's top court to approve death sentences - a move designed to stop serious abuses in lower level courts.